Two Texas congressmen (U.S. Rep. Michael T. McCaul, R-Austin and U.S. Rep. John Culberson, R-Houston) are proposing to make U.S. 290 (Northwest Freeway) into an Interstate highway. This effort is to get more federal funds for its expansion. "the federal government is too big" ... "the federal government should give us money"
Plus, what are they going to do with the plans to build the SH 249 tolll road?? I figured that when they started to drop I-69 shields on US 77, that others would want to get in on this sham. What would it be? It's "parent" would technically be I-610. An odd number 3-di is what I'd assume unless it did actually connect to 35 in Austin. Plus, where exactly will this designation go to?? The rules state that a spur of an Interstate highway must terminate at a NHS or US highway. Anyway, Interstate designation doesn't mean more funding. I love Texas, it doesn't want "dirty federal money" unless its highway funding. They want to turn US290 from Houston to Austin into an interstate. It would be an interstate because it will A: connect with a "child" route of I-10, B: would directly connect with its parent due to the new construction, C: end at either a US or interstate route in Austin. BTW: the toll road expansion of SH259 is just from Spring Cypress to FM1774. They aren't going any further at the moment. I don't think he was asking about US 290 proper being NHS or STRAHNET. He was asking what the western terminus of any such Interstate designation would be. That western terminus, per FHWA policy, would have to be at a logical termini...which in practice usually means an intersecting NHS or STRAHNET route. That means it'd have to end either at the proposed Grand Parkway (TX 99), or the freeway proper would have to be extended past Hempstead to Brenham (and TX 36). FHWA wouldn't approve an Interstate until either the Grand Parkway gets built to US 290 or the freeway is extended to Brenham. Exactly....Froggie got what I was trying to say. But, I didn't know that SH 36 was a freeway, or that US 290 had a freeway gap between Hempstead and Brenham. I may need to reacquaint myself with Google Maps more. 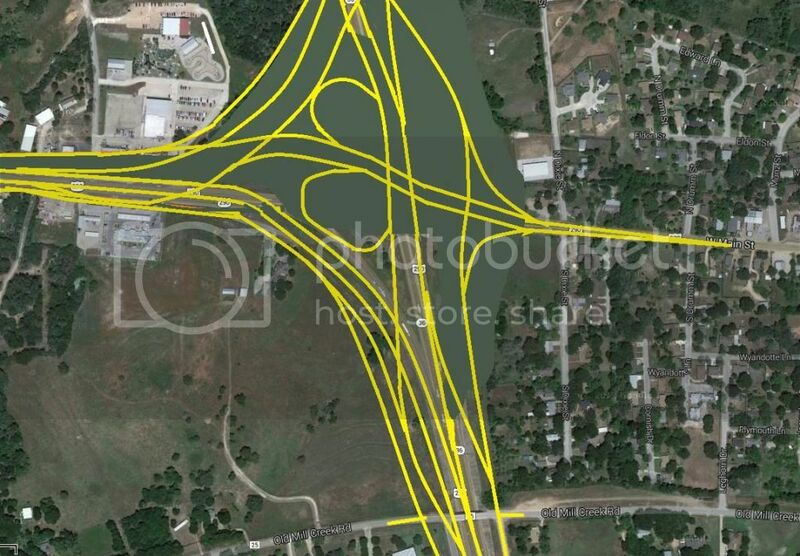 36 shares pavement with 290 on a freeway bypass of Brenham. Continuing the freeway past Brenham is problematic. Currently westbound traffic has to cloverleaf off the bypass to continue on 290. Giddings has to be bypassed entirely and the final few miles in Austin would be part of the Manor Expresseay, which is going to be a tolled. SH 36 isn't a freeway, but it's on the NHS and as such could be considered a "logical termini" for any I-x10 designation along US 290. Nothing that can't be changed. Won't be too many years before 290 is a freeway anyway, too much traffic heading that way. Hey if it takes more Houston-bound traffic off of 71, that works for me. Depends which side of Austin you live on. I"m on the NW side so its 6 of one, half a dozen of the other. We usually go out 290 & come back on 71. Why would a Congress-person from Austin care about a possible Interstate that only involves/serves the Houston area, unless there was the possibility of (and his desire for) the Interstate reaching all the way to Austin? economic development in Texas in general would benefit the Austin area. They want to make 290 into a full freeway from Houston to Austin. They also want to make a full freeway from Houston to College Station. The billion dollar question(pun intended) is what money? Isn't this state already going broke with all these road projects? Upgrading US59, Upgrading US277, upgrading US281, upgrading US290, upgrading SH249, building the grand parkway, thats not even touching DFW area. So where is this money coming from? Is it growing on trees? And if so, where is this tree? I might need to make a visit. Who would want to go to College Station? It's quite obvious most new projects in Texas will be toll roads. The gas tax hardly covers minimum maintenance and other projects you can't toll. If Austin would've been a major city in the 1950's I'm sure there would have been some kind of Interstate Highway running from Austin to Houston. However Austin was only a small regional city at the time, like various other state capitals. If they wanted to troll, they'd number it I-14. I don't see a problem adding an Interstate I-x10 spur designation to US-290. But the Interstate designation at this point could only travel to the split with TX-6 at Hempstead. The 18 mile stretch between Hempstead and Brenham is mostly 4-lane divided highway with at grade intersections. Obviously the freeway in Brenham wouldn't be able to carry any Interstate designation at this point. It looks like the long term plan is to have College Station linked to the Houston area with superhighway all the way. It might be another matter for TX-6 to carry an Interstate route designation. I sure wouldn't want to see the I-x10 route number being proposed to US-290 hang a hard right turn North to College Station. Long term (perhaps a decade or two), I can see US-290 eventually being upgraded to full Interstate highway standards from Houston to Austin. If the upgrading progress eventually goes that far it might be alright to rename it with a 2 digit number (I-12 or I-14). There are 3 digit Interstates that do travel significant distances though. I could see that, unless they pulled a Texarkana/NWA and renumbered that spur to I-14, a western I-16, I-18 or even I-12!